Mammals had already begun to evolve during the Triassic Period. But that process began to accelerate during the Jurassic, despite tough competition from the dinosaurs. That was probably because the mammals of the Jurassic Period were small and active at night, while the dinosaurs were active during the day. The ability to perceive sounds and smells is especially important in the dark, and mammals became better adapted to nighttime conditions during the Jurassic. They developed larger brains, and sharper senses of smell and hearing than their ancestors. Megazostrodon - a small mammal from the Jurassic who had a relatively large brain relative to its body size. The teeth of the earliest mammals were discarded and replaced from time to time throughout their lives, just like those of their ancestors, the reptiles. They also inherited the specialized front, canine and back teeth of mammal-like reptiles, which enabled them to eat most kinds of food. But some Jurassic mammals developed permanent teeth which remained in place throughout life. Baby teeth replaced by permanent while growing up – a successful concept for the omnivorous mammals, originating in the Jurassic. The young had baby teeth, which were also specialized and made it possible to eat most foods. 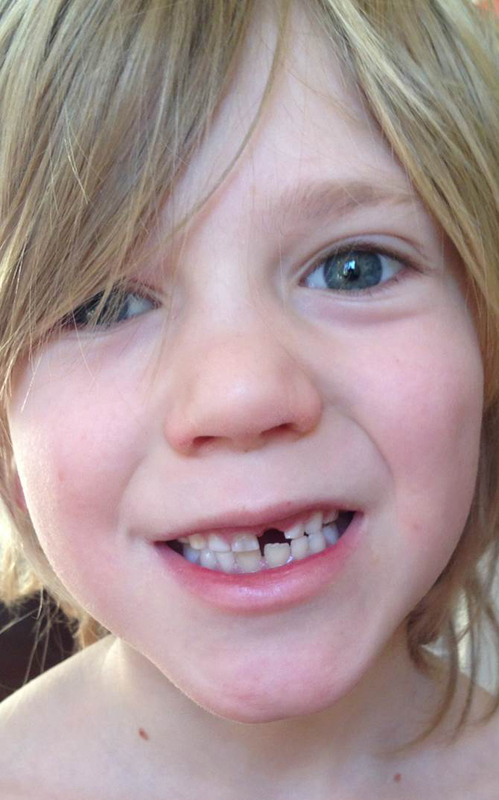 Baby teeth were replaced by permanent teeth during the growing-up period. Since food was abundant during the Jurassic Period, extremely large dinosaurs could evolve and survive. All indications are that great size was an evolutionary advantage, even for land animals. Presumably, it limited the number of enemies, since few predators would have dared to attack the long-necked giants. The exceptionally long neck was perhaps the most important adaptation. It enabled the animals to graze large areas without moving very much, which saved energy. 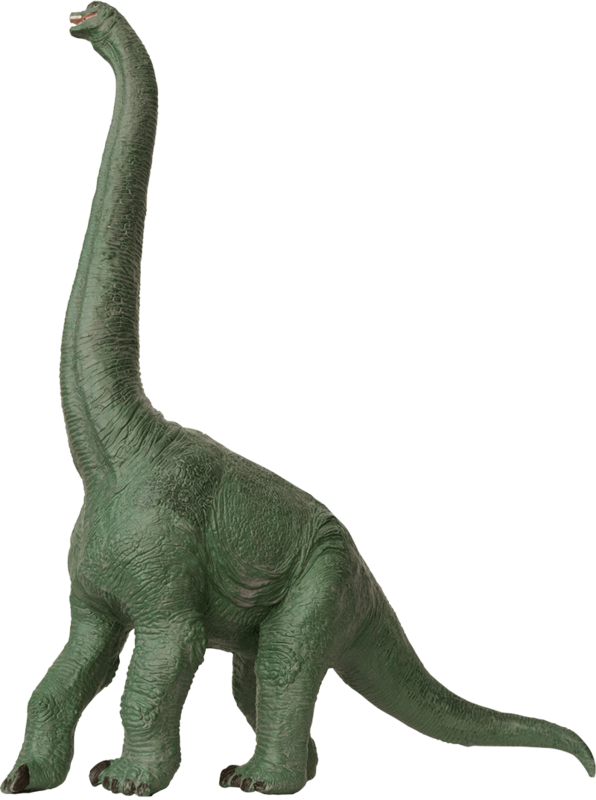 Bracchiosaurus, one of the long‑necked, giant herbivores. So the long-necked dinosaurs simply stood there, grazing and swallowing while the food fermented in their stomachs. Individuals with the longest necks could gather the most vegetation and thus had an advantage in the competition for food. The neck had special tendons and muscles which provided strength and stability. The head was small and light. Plant-eating dinosaurs did not need large and powerful jaw muscles as they did not chew their food, they swallowed it more or less whole. Their ability to digest enormous amounts of food was probably due to their large stomachs, where the food could linger and ferment, like compost. With such a lifestyle, the giant dinosaurs did not need to move about very much. But when they did, it took a lot of energy to move a body that could weigh up to 100 tons. Their skeletons were therefore light and the bones were largely hollow, like those of relatives such as pterosaurs and crocodiles. The bones of the skeleton also had air sacs that were connected to the lungs and increased the capacity to take up oxygen. Birds are the best flyers among the vertebrates. Since the first birds appeared in the Jurassic Period, a number of adaptations have improved their flying ability. In order to fly, an animal must be lightweight. The heaviest bird today is the great bustard; but it weights no more than 16 kilograms, despite a wingspan of nearly two and a half metres. 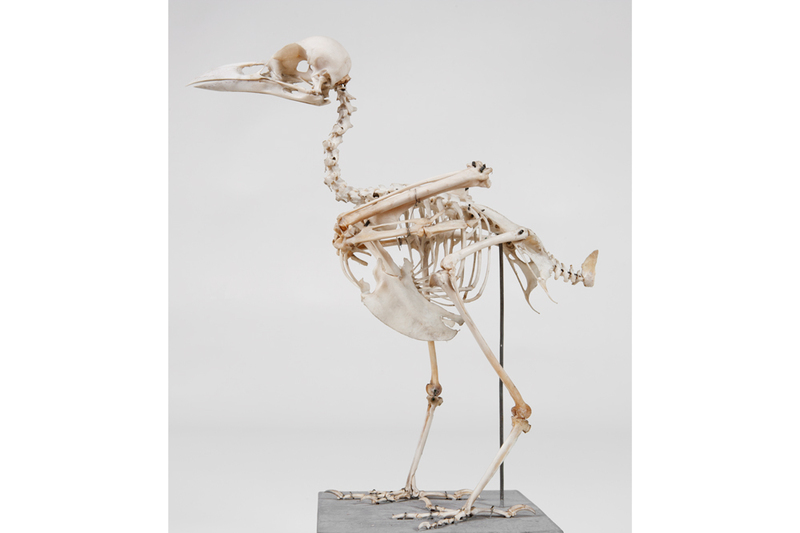 In order to minimize weight, birds have a light skeleton with largely hollow bones, just like pterosaurs (prehistoric flying reptiles) and many dinosaurs. The teeth have been replaced by a lightweight beak. Since flying requires a lot of energy, powerful muscles are needed. Flight muscles must be securely attached to the skeleton. Therefore, all flying birds have a keel on their breastbones to which the powerful flight muscles are attached. The breastbone keel is clearly visible on this skeleton of a crow. The wings and feathers of birds are, of course, the keys to their great ability to fly and manoeuvre. Wings have evolved from the front limbs of their dinosaur ancestors. They are covered with many feathers of different size and shape that are made of the structural protein, keratin. Feathers that are damaged can be replaced with new ones.